G’day! 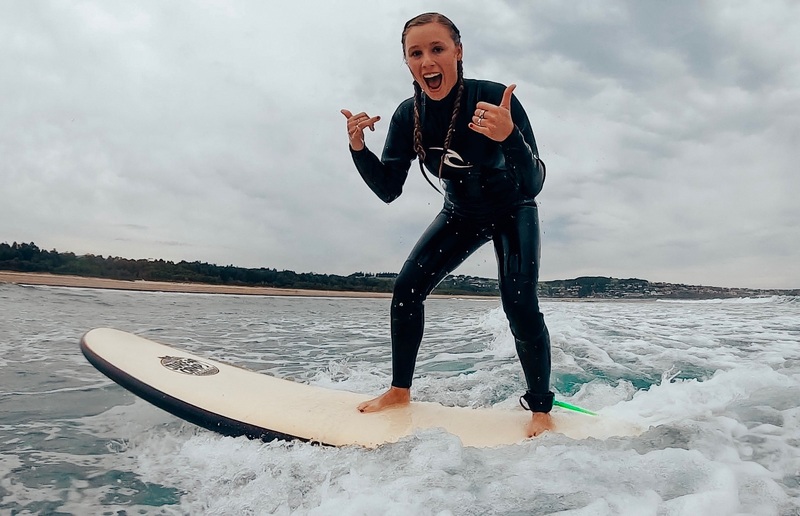 I spent this past weekend learning how to catch waves with Surf Camp Australia and it was totally tubular. My friends and I participated in the “Weekender“, an all-inclusive two-night, two-day weekend getaway at Surf Camp, which is located two-hours south of Sydney along Gerroa’s Seven Mile Beach Reserve. 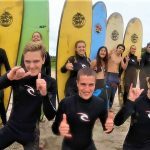 I first heard about Surf Camp from previous study abroad students, and when a rep came to our university during orientation to provide us with more information (and a discount code! ), we knew we had to sign up. After two days of nonstop fun and really good exercise, I am now recommending Surf Camp to anyone who studies abroad in Sydney. Really. It’s the best weekend. Ever. Our day started bright and early with breakfast at 9 am followed by “wetties” promptly at 9:45. I quickly learned that putting on a wet “wettie” is just about the most difficult thing to do… especially after a big meal. Our first lesson began by picking out a board and learning about its anatomy. We then learned how to get on our boards and paddle. I quickly learned that I prefer my right foot in front, meaning I am “goofy footed”, like Goofy is when he surfs in his movie. We practiced these motions over and over in the sand until getting up became muscle memory. Once we were stretched, warmed up, and felt comfortable with the motions on the sand, we were ready to (attempt to) catch our first waves! The waves, although appearing small from far away, suddenly seemed bigger than my head. I felt the rip current pulling at my legs in every direction. And my board. My board was way too large for my small hands to hold. But, when I spotted the perfect wave rolling in the distance, I knew I had it under control. There really are no words to describe what it’s like to catch your first wave. I will never forget the feeling of effortlessly gliding on water for the first time. I let the wave carry me to shore, and it was only after I got off, that I realized I had just accomplished something that very few people get to do: I surfed in Australia. The next hour was full of trial and error. Some blissful moments cruising to shore break paired with too many moments of pain as my body hit the ocean floor in a wipeout (but that’s how you learn right!). We had lunch and a rest before our second lesson of the day. This time, we began on the sand learning about different types of waves, winds, and tides. We assessed our current situation, and declared the conditions to be pretty solid. We warmed up with a run and took to our boards for the second time that day. The next two hours were harder as I could feel my muscles tightening and my bones aching, but I was able to get up a few more times, each time more thrilling than the last! After our second two-hour lesson, we had time to shower and hangout before dinner. After dinner, the whole camp (instructors included) went to a nearby pub for drinks and danced the night away! It was such a great opportunity to meet more people. We went back to the beach after the pub to end the night under the stars with our new friends. This morning we had breakfast at 7 am and “wetties” at 7:45. I was exhausted, but nothing wakes you up more than putting on a tight, wet wetsuit and hitting the ocean that early in the morning! This morning we had two full hours in the water and had the opportunity to try surfing bigger, green waves. There was no wind, the sun was shining, and the conditions were perfect. The two-hours FLEW by. I challenged myself on some bigger waves and improved my form on the smaller ones. I could’ve stayed out there for hours! We ended our final lesson with a team cheer and group photos on the beach. After packing up our cabins and eating our last camp meal, we said goodbye to the instructors and to the best weekend ever. Not only was learning how to surf too incredible for words, I met so many amazing people this weekend. I had no phone service at camp, which reminded me of my days at sleep-away camp in New Hampshire, and made me appreciate being truly present for the first time in awhile. I loved every moment and can’t wait to rent my own board next time I’m at the beach! Except Bondi. I will never be good enough for Bondi.